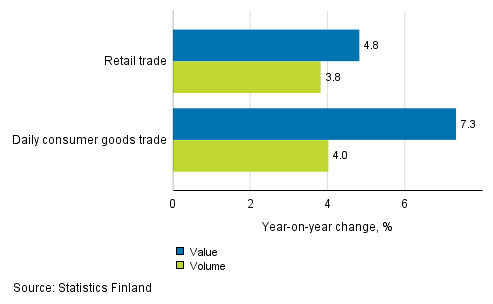 According to Statistics Finland’s retail trade flash estimate, retail trade sales increased by 4.8 per cent in March from March 2017. Over the same period, the volume of retail trade sales, from which the impact of prices has been eliminated, grew by 3.8 per cent. In daily consumer goods trade, sales increased by 7.3 per cent and the sales volume by 4.0 per cent in March from the corresponding period of the previous year. The reported annual changes in trade sales and sales volumes are not seasonally or trading day adjusted, which means that the effects of public holidays are not considered. In March, the development of sales was partly due to Easter being at the turn of March and April this year, while last year it was in April. The fact that Easter occurs in different months is in particular visible in the sales development of food during March and April. The retail trade flash estimate is based on a sample covering, on the average, 60 per cent of retail trade turnover. Data on trade sales by industry will next be released on 14 May 2018. ISSN=1799-0939. March 2018. Helsinki: Statistics Finland [referred: 25.4.2019].